Drinking tea is national pastime for Brits, a fact that is keenly reflected in our literature. To many British people, myself included, drinking tea is as much a part of our lifestyle as apologising too much and grumbling about the weather. Since its arrival from China through trading in the mid-16th century, and its subsequent appropriation by the East India Company, tea has become a fundamental part of British culture. As a country we’re the third largest consumers of tea per person in the world, with the average Brit drinking 4.2 pounds of tea a year. It’s a national pastime that has been parodied and stereotyped far too often to keep track of, and is something keenly reflected in our literature. Tea is as highly present in our writing as it is in our culture, with it being referenced in novels in scenes ranging from high-society tea parties to casual cuppas. Nineteen Eight-Four writer George Orwell even wrote an essay based around the supposedly ‘correct’ way to make a cup of tea, describing the drink as ‘one of the mainstays of civilization in this country’. Although, he also wrote that apparently ‘you destroy the flavour of your tea by putting sugar in it’, so I’m not sure I can completely trust his opinion on the matter. This use of tea within high society in Austen’s novels can link back to the drink’s origins as something largely only drunk by the upper classes due to its initial high price, and is still something associated with the rich today. For Austen and those who read her novels, tea is linked with sophistication and polite social encounters, something keenly reflected in her literature. Then there's one of the most famous tea parties in English literature: the Mad Hatter’s tea party in Alice’s Adventures in Wonderland. 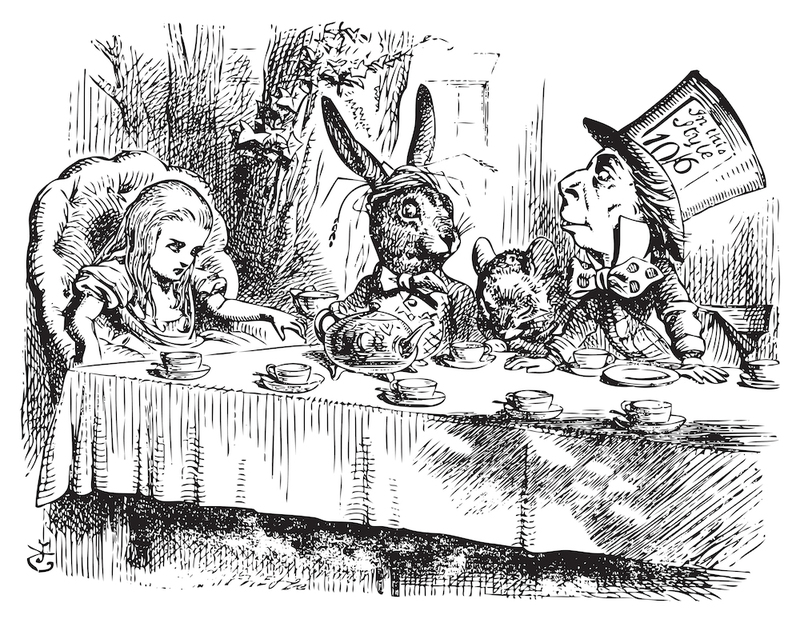 Rather than being a high-brow Austenian affair, Lewis Carroll paints his alternate-reality tea party as a chaotic event, filled with insults and riddles. Alice tries to act well-mannered and steer the others towards polite conversation, but is consistently upended by the others. She angrily declares it ‘”the stupidest tea-party I ever was at in all my life!”’ and leaves after being unable to take unruly mess of it all. Tea has latterly become a drink of the masses. This is something shown in more modern books like Douglas Adam’s The Hitchhikers Guide to the Galaxy. The main character, Arthur Dent, is presented very much as a typical, everyday Englishman, almost to the point of banality. When faced with the complexities of the universe and alien life, rather than having an existential crisis or becoming enlightened, Arthur asks ”Is there any tea on this spaceship?” While I completely agree with his priorities, this presents tea as an almost necessity of life for the English, a fact played both for laughs and likely to be relatable for an English reader. In fact, Douglas’s own love of tea is shown in the book’s dedication, which reads ‘for Jonny Brock and Clare Gorst and all other Arlingtons for tea, sympathy and a sofa’. Tea has permeated as much into English literature as it has into our culture. Its infiltration into English literature shows how common a drink it has become for British people everywhere, and, to be honest, all this tea-talk is making me want a cuppa right about now.